Please register for this hike using the Register box below. Get Your Kicks at the LA County Fair. Everything Route 66 for this year’s theme celebrating the intrigue and culture that called travelers from around the world to journey the 2,448 miles along Route 66, the Mother Road. Go on a road trip along historic Route 66 on a fun, interactive, educational and artistic journey, visiting all eight states - Illinois, Missouri, Oklahoma, Kansas, Texas, New Mexico, Arizona and California. Did you travel part of Route 66? 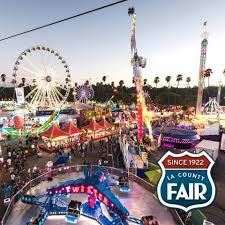 It’s an end of summer trip to enjoy an afternoon at the LA County Fair in Pomona. Lots of exhibits and attraction celebrating the historic and legendary Route 66. Unique displays with lots of gourmet food vendors, deep-fried of course! Shopping,vendors, art, photographs, gardens, railroad stuff, cute animals and Budweiser Clydesdale horses. 10:00 AM Meet at PetsMart, Ramon/Crossley. Carpooling may be available.